Are you tired, inside and out? Are you overwhelmed with choices and expectations and pressures, trying your best to measure up–yet you still feel as if you're losing ground and missing out on the best parts of your life? Admit our greatest needs and watch them be filled by the only One who can meet them. As you wade into the refreshing truth of the more­-than-­enough life Jesus offers, you’ll experience the joyous freedom that comes to those who are determined to discover what God can do through a soul completely in love with Him. Jennie Allen is a recovering achiever who is passionate about Jesus. She is the best­selling author of Anything and Restless, as well as the founder and visionary for the million­-strong IF:Gathering, which exists to gather, equip, and unleash the next generation to live out their purpose. Jennie speaks frequently at conferences such as Catalyst and Q. 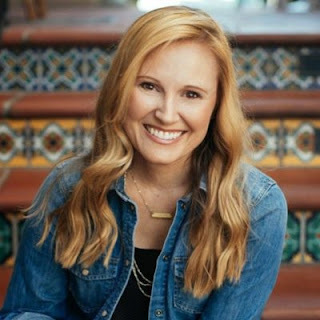 She holds a master’s degree in biblical studies from Dallas Theological Seminary and lives in Austin, Texas, with her husband, Zac, and their four children. I really felt like this book couldn't have come at a better time for me. Trying to prove my worth by performance and then feeling overwhelmed when I do, is getting old. How does one break out of this pattern? Jennie Allen gives us the tools. The thing I love about Jennie Allen's writing is she makes you feel as though she is sharing her life with you as a friend. She doesn't pretend to be something she's not, therefore, making you feel as though what you are going through or feeling is not odd or bad. I felt such a relief as I read that my needing to prove my worth is not something only I am feeling. So many women feel this way as we make our way through life. 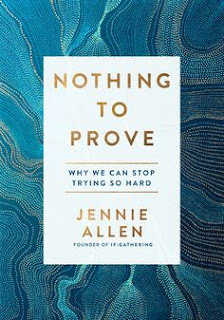 Jennie reminds us that God doesn't require us to prove ourselves. He loves us just how and right where we are. Lots of Biblical wisdom and Scripture make this book an absolute favorite. I am reading it again because I need to be reminded of these truths again as I live my life not feeling I must prove myself. I love this book and give it 5 out of 5 stars.